Seventeen London bridges are to be lit up at night as a permanent light art installation, the Mayor of London Sadiq Khan has announced. Chelsea Bridge, lit at night. Photo by Torsten Reimer from the Londonist Flickr pool. A global search has been launched to find artists and architects to create the illuminations, which aim to encourage new investment, increase use of the river, bridges and riverbanks at night and boost a vibrant night-time economy. Designs must be environmentally-friendly. The project will be the world’s longest free, permanent outdoor river gallery, creating a ribbon of light through the city at night — especially during winter when the river is often a dark strip in the city. Funds for the £20m project will be raised, largely from private sources, by the a new charity, called the Illuminated River Foundation, backed by the Rothschild Foundation. Hannah Rothschild, chair of the Illuminated River Foundation, said: "Even by London’s standards, this project is unprecedented in boldness and imagination: the opportunity to influence and transform the look, identity and experience of the world’s greatest city." 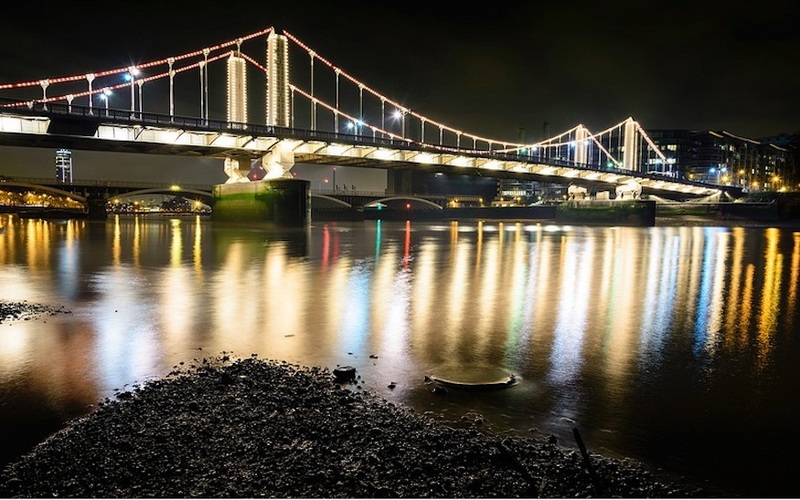 Mayor of London, Sadiq Khan, added: "This is a really exciting opportunity to breathe new life through the heart of London each night in a new, permanent, fluid light art installation across the capital's historic bridges. It will throw a spotlight on the river and its banks, and extend their daytime bustle and buzz into the darker hours, supporting London’s burgeoning night-time economy. A dazzling, free outdoor art gallery, for Londoners and all of our visitors to enjoy would encourage new investment and promote our great city to the rest of the world. "With the right design, we can remind the world that London continues to be the global leader in innovation, sustainability and artistic creativity." Teams wanting to apply must do so before 7 July. The shortlisted schemes will go on show in a public exhibition at the end of the year, after which a winner will be announced.